True, he’s not an NHLer, but he needs to be on our list anyway. Be sure your sound is up. Apparently Pierre McGuire looked thirsty during a live interview. The San Jose enforcer doesn’t score much — he has only three career goals. So when he got his first as a Shark, he did what any rational person would do: had a T-shirt made. I think we should all do this for our personal career highlights. I’m getting a shirt made with a photo of me at the moment I came up with last week’s “Salt-N-Puppa” joke. The issue: The league announced the roster for its upcoming All-Star Game. The outrage: Snubs! Snubs! So many snubs! Is it justified? There are really two types of All-Star snubs. You have the guys who deserve to go based on their season, like Nicklas Backstrom, Joe Pavelski, and Marc-Andre Fleury. Then there are the guys who should almost always be there based on lifetime achievement and/or sheer star power. That list would include P.K. Subban, Erik Karlsson, and Pavel Datsyuk.1 Subban is the worst of this year’s snubs — the idea the NHL wouldn’t feature one of the most exciting and charismatic players in its recent history is laughable. Unfortunately, there’s really no way to avoid this kind of situation as long as the league insists on having all 30 teams represented. The league dropped that rule in recent years2 but went back to it this season. Factor in Chicago fans stuffing the ballot box and the weird compulsion to overrepresent the host city, and there’s just not enough spots left for the actual stars. This is today’s NHL. Everyone is above .500, nobody ever has a losing streak, and every team has an All-Star. Sidney Crosby’s mom is bringing orange slices, and Old Man Bettman said he’d take us to Dairy Queen if we try hard. It’s true that some fans like the 30-team rule. Those fans are wrong. The league should try to cover as many teams as possible, sure, but making it a requirement that everyone be represented just reinforces how little the All-Star concept means these days. So yes, be outraged about all the ridiculous snubs if you’d like, but only if you’re willing to call out the awful rule that causes them. If you want equal representation for everyone, you don’t get to complain about how dumb the final rosters look. Teemu Selanne had his number retired in Anaheim this week. It was the latest honor for an all-time great who’ll no doubt go into the Hall of Fame the second he’s eligible. My favorite bit of Selanne trivia is that he played for a million years, yet still sits just fourth in career games played among the 1988 draft class, trailing Mike Modano, Rod Brind’Amour and Mark Recchi. Selanne was the 10th pick in that absolutely stacked draft, and the last of a string of four players who combined for some amazing numbers. From no. 7 through no. 10, that year’s picks were Martin Gelinas, Jeremy Roenick, Brind’Amour and Selanne. Combined NHL totals: 5,571 games, 1,958 goals, 4,517 points, and 20 All-Star Games. So naturally, this week’s obscure player is the guy who went sixth that year: Scott Pearson. 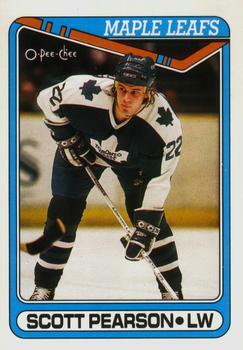 Pearson was a big, tough winger who’d put up decent offensive numbers in the OHL. But his skills never really translated to the NHL, where he played just 292 games while shuttling between five teams. His managed more than 15 points in a season only once, finishing with just 98 points over a 10-year career. Was he a bust? Maybe not on the level of other guys who never even made the NHL at all. But compared to the four players who came after, yeah, Pearson was a major bust. And no, I’m not going to bother telling you which team drafted Pearson at no. 6, passing over the four future stars who’d follow right after, including Selanne. If you’ve been paying attention over the years, you’ve already guessed. We’re six weeks away from the trade deadline, slowly but surely winding our way to the part of the season when the market heats up and rumors of potential blockbusters start flying. None of those blockbusters will happen, of course, because trading is hard and NHL GMs aren’t expected to do it anymore. But they’re still fun to talk about, and you can’t blame fans for getting sucked in. But this year, here’s one suggestion to make the whole thing go a little more smoothly: Let’s try not to freak out about reports that this team’s scouts and/or front-office guys have shown up in that team’s arena. We do this every year. Right around this time, we start getting breathless reports that there are two Kings scouts in Detroit, and the assistant GM of the Bruins is in Calgary, and a dude wearing a Hurricanes cap was just on my flight to Minnesota. WHAT COULD IT ALL MEAN? Here’s the thing: There are guys from a bunch of teams at every NHL game. It’s not a big deal if a GM or front-office guy shows up, because 90 percent of the time they’re just in town to visit friends or family. As for the scouts, they go to these games because that’s their job. And don’t get worked up when more than one shows up, because there are roughly three million scouts in this league. Seriously, lean out your window right now and yell “chicken wing night” and a half-dozen NHL scouts with expense accounts will show up within minutes. Trades are fun. Trade rumors are fun. But stop bombarding us with reports of which teams are in which buildings, because it rarely means anything. The Ducks did a good job with Selanne’s ceremony, and commissioner Gary Bettman even dropped by to pay his respects. All in all, things went smoothly, as you’d expect from a polished professional sports league like the NHL. Of course, it wasn’t always this way. Twenty years ago, Bettman and friends were still getting the hang of this whole ceremony thing. So for this week’s clip, let’s travel back to 1994, as the league tries to honor another California hockey legend. • It’s March 23, 1994, and Wayne Gretzky has broken the sport’s greatest record: With 802 career goals, he’s passed Gordie Howe to become the league’s all-time leader. It’s a big deal, and Bettman is there to mark the occasion. • We start off with Bettman and a sweaty Gretzky, who are standing three feet apart surrounded by media instead of being spaced out like in a normal pregame ceremony. That’s odd, and it’s going to make this whole think awkward in a close-talker sort of way. There’s also a good reason for it, which we’ll get to in a second. • Bettman gets a smattering of boos when he’s introduced, which is pretty impressive considering he hasn’t even had a lockout yet. Who said L.A. wasn’t a hockey town? • By the way, Bettman’s name was spelled in all lowercase back then, because it was 1994 and we were all too cool to use the shift key. • Seriously, the NHL made him a scrapbook. That seems underwhelming. I wonder if Bettman made it himself? I’m just going to go ahead and assume he did. • In my favorite moment of the clip, Gretzky halfheartedly lifts the book up, at which point the crowd actually laughs. Bettman worked hard on that, you jerks! He had the little zig-zaggy scissors and everything! • You’re all waiting for me to make a joke about Janet Gretzky being too close to a sports book, and it’s not happening. • And now it’s Gretzky’s turn to speak. Sadly, he decides not to reenact the entire “Waikiki Hockey” sketch, and instead launches into a speech thanking everyone who made the day possible. • His first thank you: the Vancouver Canucks, which seems weird until you realize they’re standing just off to the side, because this ceremony is taking place during the game. It’s the second period of a 2-2 game with playoff implications! We get a shot of the Canucks, who really look thrilled about this. • I miss ceremonies that interrupted games. We need to get back to this. If John Scott scores a second goal this year, I want them to stop the game while we make him a new T-shirt. • Now Gretzky’s walking through the history of California hockey while thanking Bruce McNall, the Kings owner who’s a few months away from being sentenced to jail for fraud. Where does “Wayne Gretzky, Bruce McNall, and John Candy once convinced the consensus NFL no. 1 draft pick to come play in Canada” rank on the list of all-time weirdest sports stories? I feel like we don’t talk about that one enough. • Now Gretzky is thanking his family. He mentions his parents and his wife, but forgets his kids. Somewhere, a 5-year-old Paulina vows to get revenge by spending the rest of her life making him miserable. • And that’s pretty much it. The rest of the clip is mostly replays. I always liked how the record-breaking goal was scored into an empty net because Kirk McLean had wandered off into the corner like a glitchy NHLPA Hockey ’93. Way to own the moment, Kirk. Gretzky finished his career with 894 goals. Given current scoring rates, that record is considered unbreakable. But just in case anyone ever gets close, somewhere hidden deep within NHL headquarters, Bettman still has his scrapbooking kit ready to go. Have a question for Sean? Want to suggest an obscure player or a classic YouTube clip? Send all your grab bag–related emails to nhlgrabbag@gmail.com. Some of these guys will probably still get in as injury replacements. It used the YoungStars Game and skills competition to cover everyone, but left some teams out of the main event.